Today, technological achievements that significantly influence communication management are Social Networks in virtual environment. The latest research clearly indicates that this trend is going to last in the future. It is considered as a fact that there are many changes and innovations in the field of information and communication technologies during the past few decades. Development of communication technologies has provided a new framework for organizing corporate communication processes, both internally and externally. Channels for the transfer of relevant information had been faced with huge technological improvement, but fact analysis and former research do not provide insight into specific motivation patterns for usage of Social Networks among employees, nor into their influence on Communication Satisfaction within the organizations. Considering the ability of internet page for development of communication through the dialog, the effective use of internet represents immense importance for relationship management. However, exclusive exploitation of technology does not contribute to the process of making and maintaing good relations and Communication Satisfaction among the employees. In addition, it is much more important how does technology is used, as well as to understand the communication through the dialog. New forms of media are the genuine challenge for instigating the engagement of employees, offering relevant information, and also for gathering feedback information, via open dialog, moderate and imperceptible control, listening the conversation, and decent communication. Communication Satisfaction within the organizations is mainly related to several factors such as corporate informing, feedback information, communication media, organizational climate and culture of the organization, horizontal and informal communication, communication with management, etc. The medium which is used by employees for their communication is also a key factor, since the media influences satisfaction of employees, and this chapter will clearly prove that. 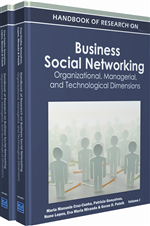 understand and study Social Networks in the context of internal communication and relationship throughout two key questions: 1) How did it change relationship between employees within the organization in this age of digitized global networks? 2.) Does they, and how do informal virtual Social Networks, affects Communication Satisfaction within the organizations? The mission of this chapter is to perform a research and verify influence of employee’s participation in Social Networks in the context of Communication Satisfaction within the organizations. The term Social Media means new electronic and web-based communication channels (e.g. blogs, podcasts, wikis, chat, discussion forums, RSS technology (really simply syndication), web sites, Social Networks, etc.). These media allow faster flow of communication connecting people, giving them a voice and video; encourage them in discussions on the topic of common interest (Smith, 2006). “New” Social Media provide “global conversation” in which everyone can participate, share opinions, knowledge, ideas without time and geographical constraints, bypassing traditional means of communication (Levine, 2000). Almost a decade ago, Middleberg (2001) noted that internet and new media that came with internet are channels of communication which allow people to express their speed, accuracy, and creativity without any constraints. The major problem is in experts for external communication who were much quicker adopters of new media than those who dealt with internal communications. New media certainly require professional communicators to change and adapt tactics and strategies of internal communication, because they represent a challenge to encourage involvement of employees, providing relevant information and feedback, through open dialogue, moderate and seamless control, listening to the conversation, and honest communication. Evan though the communication face to face is the best way to create strong ties based on mutual trust and respect, through a two-way symmetrical dialogue (Grunig et al, 2002), it is impossible to imagine today's relationship between employees without use of sophisticated communications and technology. The combination of face to face and virtual communication is a starting point of effective internal communication (Argenti, 2003).